You’ve got to love any food item invented solely for the purpose of stimulating increased beer drinking. 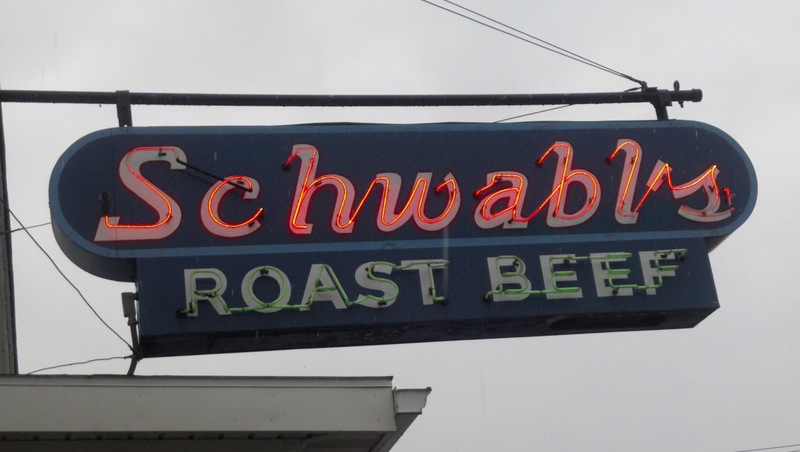 I guess that’s why I was so excited to try Schwabl’s world famous “Beef on Weck”. That’s a stimulus plan even I can support! According to Buffalo mythology, this unique roast beef sandwich on salt and caraway seed-studded buns was invented by enterprising bar tenders in this blue collar city who wanted to encourage their patrons to drink more beer. The powerful punch of salt and caraway on the big yeasty rolls definitely makes you thirsty. Fortunately for Suit757, my weekend started early after my final meeting of a long week wrapped up at 11 on a Friday morning. 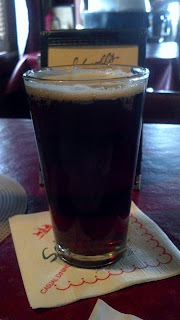 Despite the AM hour, I felt it was my duty to order a locally brewed Flying Bison Aviator Red to accompany my Beef on Weck. A sweet, malty brew with a dark red color, my Flying Bison slid down easily – just like it should. Schwabl’s is considered one of the oldest restaurant operations in America, dating back to 1837. 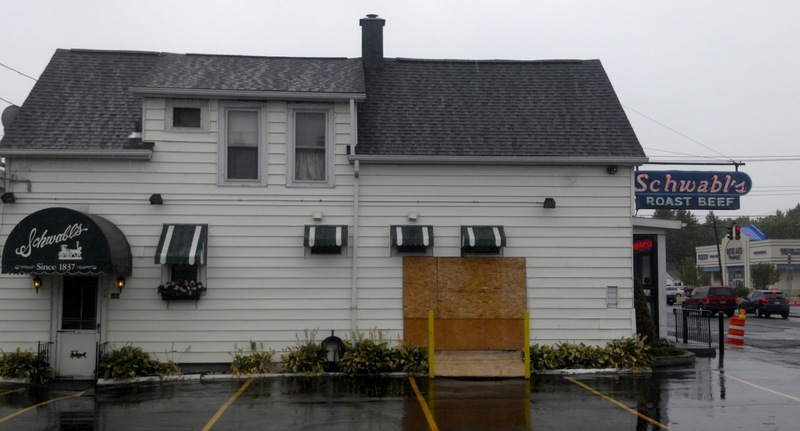 Of course it has changed locations many times over the past two centuries, but this location in West Seneca dates back to the 1940s. It stayed in the Schwabl family for most of the past 185 years until a couple long-time employees bought it a few years ago. But it doesn’t look like much has changed. 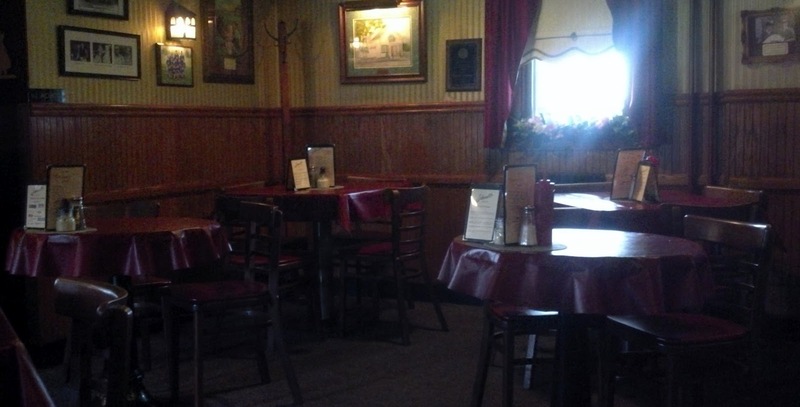 The atmosphere is definitely old school. Stepping through the creaky screen door is like stepping back in time. 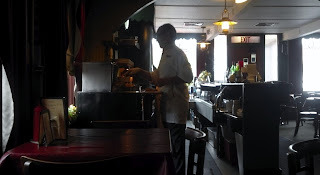 An old timey cash register, leather bound menus and old men sipping 11am martinis and cracking jokes set the mood. Waitresses dressed in all white uniforms look like nurses from a 1950s soap opera. They know every customer by name. I barely even glanced at the menu. Anyone coming to Schwabl’s for the first time orders the specialty of the house, Beef on Weck with German potato salad. 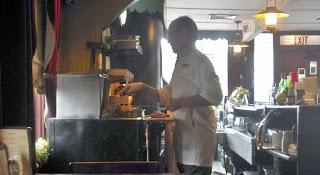 The bar tender – also dressed in a white apron and tie – opened up the beef steamer right behind the bar and meticulously carved off several slices of the roast and neatly piled them onto a half of a kummelweck loaf, made here in Buffalo specifically for this sandwich. Not to be a downer, but I just wasn’t that impressed. Maybe Beef on Weck is just a little TOO old school for me. I mean, this sandwich could use a serious bout of modern creativity. Some sautéed onions maybe. Or melted cheese. Or greens. Or spicy homemade mayo. 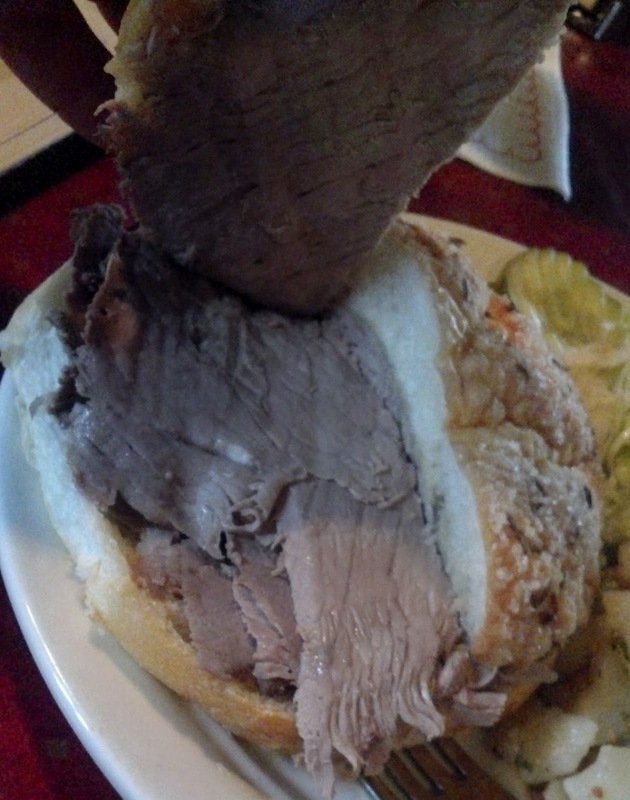 As it was, my Beef on Weck was just some slices of dry boring roast beef on salty bread. Part of the problem may have been my early arrival. My very professional waitress warned me that since it was a new roast, my slices were going to be “medium-well”. Pinker, juicier meat might have elevated this sandwich to a higher rating. The only condiment provided was a little tableside ramekin of horseradish. A little of that goes a long way. It only conspired with the salt and caraway seeds on the bun to make me drink my Flying Bison even quicker. The cole slaw and pickled beet on the side were saturated in salty vinegar. Not really my thing. The highlight of the meal (beside the Flying Bison that is) was the German potato salad. Garnished with bacon bits, celery and other fun, tasty ingredients, the potato dish was served warm, as is customary with this Old World version of potato salad. So the potato salad and beer were good. The rest of my $22 lunch (including tip and tax)? Not so much. I guess I just don’t get the concept. You don’t need to feed me tasteless roast beef on a salty bun to get me drink beer. 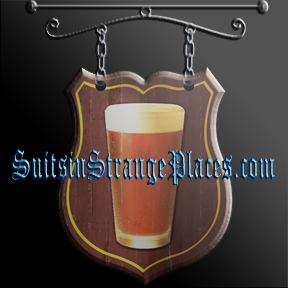 Beer drinking requires no excuse for Suit757. Rating: Wouldn’t Wear Shirt if You Paid Me. Ouch, that's harsh. 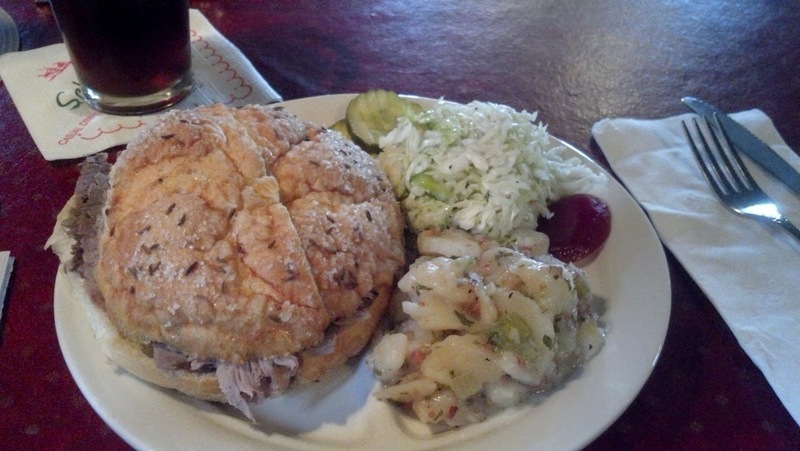 Try Beef on Weck somewhere else before you write it off. 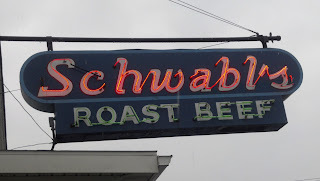 The presentation at Schwabl's is accurate; the only "permissible" condiment for Beef on Weck is horseradish; sides should be potato salad or coleslaw. Oddly, the best Beef on Weck I've had lately was where I live now, in Fort Worth, Texas, at Buffalo Bros. The roll is a little less yeasty and more of a hard roll (in true kimmelweck style). I think the owner, a native Buffalonian, gets them specially made locally to his specifications, and he remembers the hard roll style that was popular before Buffalo area restaurants started catering to the false teeth crowd. 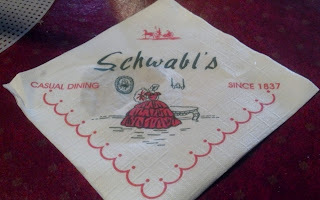 I forgot to mention... my mom lives a couple miles from Schwabl's. Thanks for the advice! 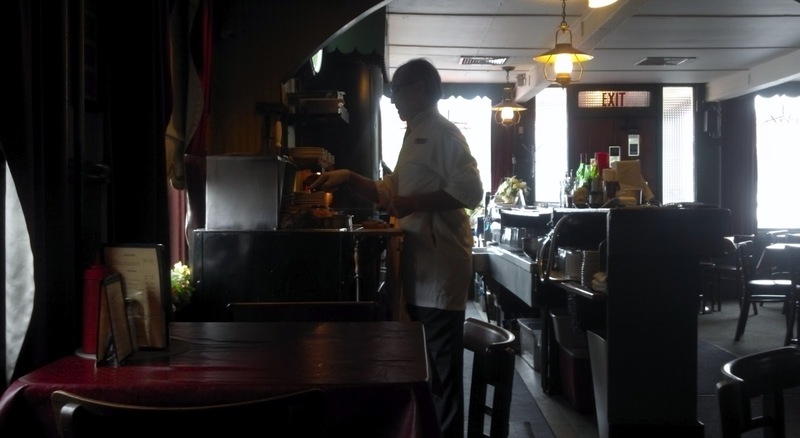 I'm willing to give Beef on Weck a second chance -- maybe Charlie or Butcher or Buffalo Bros. next time. There's always a "next time" for Suit757! Yeah, I have recently fallen in love with German food and more or less ditched the Italian food that I grew up eating. There just is nothing like sauerbraten or beef on kimmelweck bread in the traditional Italian cuisine. German food is so incredibly underrated that I can hardly describe it here.